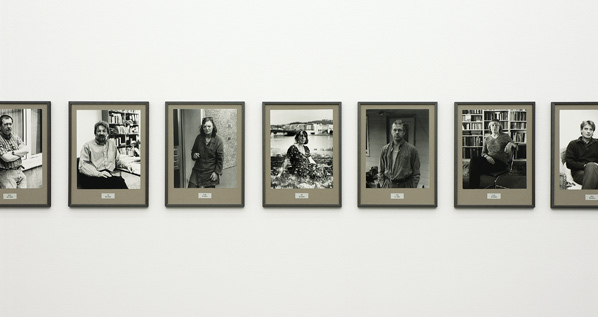 For 100 Jahre [100 Years] (2001), Hans-Peter Feldmann took one black-and-white photograph per year of his parents, friends, and acquaintances in order to reconstruct the length of a human life, situate himself in a chronology, and address life and death. In the exhibition, his social circle physically surrounds us and presents a continuous cycle, “from zero to nothing,” that naturally appeals to us to situate, remember, and project ourselves, but above all challenges us to take account of the vanity of existence. Born in 1941 in Düsseldorf, Germany, Hans-Peter Feldmann lives and works in Düsseldorf. Since the late 1960’s, he has created works that highlight images drawn from popular culture and based on ordinary materials. By using collections of found images, as well as appropriating common objects and family photo albums, Feldmann essentially questions the way that we construct our world. Reluctant to comment on his work, he refuses as much as possible to participate in the symbolic bidding associated with the contemporary art scene. Nevertheless, the prestigious expositions that he has been associated with, as well as the Hugo Boss prize that he was awarded by the Guggenheim Museum in 2010, are evidence that Feldmann’s critique has played an important role in contemporary culture.